Over the years we have developed a repeatable, efficient process for the development of websites. Website development projects for small to medium sized websites are usually completed in one iteration in the timeframe of a few day to one month. Large and complex website development projects can take several months. 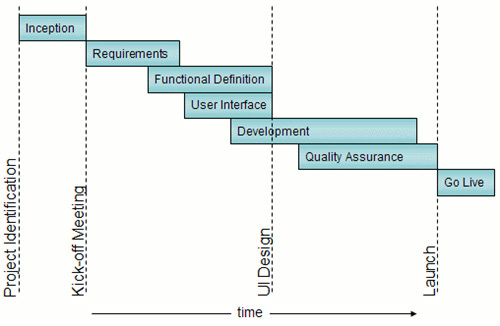 The develop process we employ involves considerable interaction and feedback with the client throughout the project. It is important to note the UI design is determined about half-way through the project. This helps ensure the design is driven by the functionality and business need instead of the other way around. Every project is unique. The website development process will be modified to meet individual goals of each project. Personal Website: A personal presence on the Internet can be both fun and rewarding. Are looking to create an online photo gallery to share with family and friends, start an online blog, promote your company on Facebook (FB), design an Internet portfolio, or want personalized email? If so, then our Personal Website solution is the right choice. Business Website: Do you want your company to compete against larger companies and promote better professional services than your competitors? If so, we can assist you in promoting your company's services online in specific markets and/or regions with our Business Website solution. E-Commerce Website: Do you have a few items or over 5000 items you want to sell online? We can design your website to do either. Our E-Commerce Website includes a personalized shopping cart, dedicated SSL certificate for secure online transactions, integrated control panel for managing products, customers, vendors, and customer promotions. Personal Website Includes personalized email with optional dynamic menus, web counters, online photo galleries, or online blog. Business Website Includes dynamic menus, online forms, advanced scripting, dynamic content, and/or hosted database. E-Commerce Website A business website plus tools to manage products, manage vendors, automated shipping, credit card payments, dynamic content, visitor personalization.